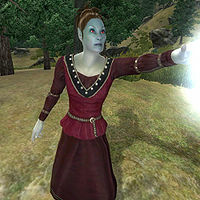 Bralsa Andaren is a Dunmer mage currently residing near a wayshrine to Kynareth, specifically the shrine between Weatherleah and Nonungalo. She is the Master trainer in Destruction and has a very special task she wants you to perform before she will train you. She spends all of her time in the wilderness, apparently hunting for venison in the area surrounding the shrine. She prefers the area around Nonungalo or Fort Dirich but when chasing a deer, can follow it extremely far away in any direction, making her pretty hard to find. At 11pm, she will head back to her bedroll, which is located a few steps south of the shrine near three big rocks, sleeping there until 7am. She only offers Destruction Master Training when she is hunting, from 7am to 11pm each day. She wears a burgundy linen shirt, a pair of matching linens, and thick cowhide shoes and carries a few gold coins. She does not carry any weapons but has a leveled set of major Destruction spells as well as leveled mage's spells from all magic schools. When you approach her, she will respond rudely: "Begone, stranger! I have business with Kynareth's shrine, and I will not be disturbed." If you have triggered the quest, it's another matter. Like herself, she wants you to battle the local wildlife in order to challenge the gods: "You seek training? If I were to aid you, you would first have to assist me. I would strip the Creators of their works... you will help with this. Bring me 20 bear pelts, as proof that you have helped tear nature asunder. Then we shall speak of spells and teaching." If you return empty-handed, she will get angry: "You have not done that which I ask. Kill the bears and bring me their hides. Then I shall do as you ask." And when you bring her the twenty pelts, she will be happy; "Very good... Very good indeed. The Creators shall take notice soon enough, and then they shall have me to deal with! You have done your part, so I shall do mine. What I know I will teach you." The only people who seem to have heard of Bralsa are the two advanced Destruction trainers. Marc Gulitte will tell you that "The only way you can learn more about Destruction magic now is to find Bralsa Andaren. She can train you better than anyone. Good luck finding her, though. 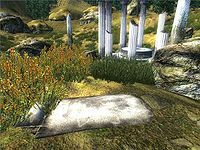 The latest I heard was that she had wandered off into the wilderness, looking for a shrine to Kynareth." and "If you want to learn more about training Destruction magic, you'll have to find Bralsa Andaren." Delphine Jend concurs. She has a little more information to give you about Bralsa, however: "If you want to know more, there's one person I can think of to teach you, though she's a bit... odd. You'll need to find Bralsa Andaren. Best mage I've ever seen, but a bit eccentric. Last I heard, she had camped out at a shrine to Kynareth, and was killing wildlife for fun, I think."